There is always this tension that exists when blogging. It’s a kind of am I cool enough for this sort of tension combined with an oh my god, people might actually read this and therefore I should think about what I’m writing tension. I’m not a big fan of tagging along with other people’s trends and therefore have avoided mentioning meat-free Monday. It’s all the rage right now, for those of you who might have missed it and is tied in with arguments around global, industrial food etc. I’ve debated a lot recently about posting anything on the whole food system debate. It serves the overwhelming context for my research and so I’ve been doing a lot of reading into it but I feel that this blog is more a testimony to my love of food than a discussion point about the ethics of what I’m eating. For the record though I now find food choice much much harder and I feel guilty if say, I get all your can eat chicken wings when out with friends. It’s just another tension I have to live with. But I digress. This is a great recipe anytime of the week but if you’re feeling particularly guilty on a Monday, it makes a seriously good veggie dinner. If you can’t stand the idea of doing meat-free anything I suggest you fry off some bacon pieces at the beginning and then keep them aside to toss together with everything else at the end. Get the pasta on the boil. I used orecchiette, but feel free to use the pasta of your choice. Slice the shallot, finely chop the garlic and the chili. I use chili plus seeds but feel free to de-seed the chili before you add it to the pan. 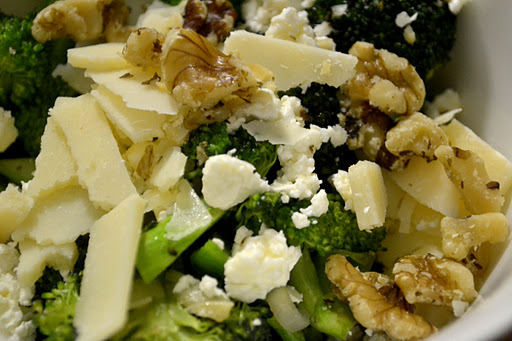 Cut the florets off the broccoli into bite size pieces that will cook quickly. Heat some butter and olive oil in a non-stick frying pan until the butter bubbles. Add in the shallot, garlic, chili and broccoli. Toss everything together nicely and allow to fry for a few minutes. Add in some hot water to create a little steam effect and leave until all the water has disappeared. Drain the pasta, toss into the pan with the broccoli and give everything a good shake. 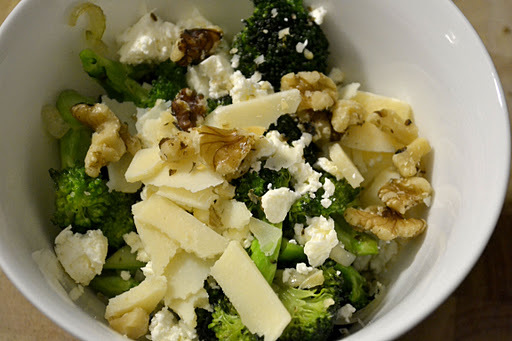 Tip this into your bowl, crumble in some feta and Parmesan, add a swirl of black pepper and as many walnuts as you’re in the mood for and eat! I like the broccoli to be done only al dente so this is the kind of pasta you can make when starving cause it only takes about 12 minutes, or the time to cook the pasta really.